Though you wouldn't typically think of crab legs as something to throw on your smoker, smoking crab legs actually imparts a flavor that you just can't achieve with the standard steam or boiling methods. Some grill masters may argue the shell doesn't allow the smoke to penetrate the meat in order to flavor the crab legs, but we beg to differ. Plus, some grocery stores are starting to carry crab legs that are cut in half to make the crab meat easy to access. This new convenient feature makes smoked crab legs even more delicious if you are lucky enough to find them. The recipe below will teach you all the steps and ingredients you will need to smoke up a delicious seafood dinner without the restaurant price. Start by firing up your smoker to get it to a temperature of 225 degrees. Then put your smoker wood chips on the smoker. Next, put your butter, lemon juice, lemon pepper seasoning, and garlic in a mixing bowl and place the bowl in the microwave for 30 seconds or until the butter is fully melted. Stir the ingredients together. This mixing bowl will be used to baste any exposed meat on your king crab legs while you are smoking them. 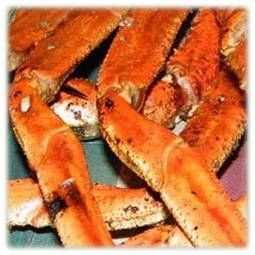 Set your king crab legs on the smoker for about 25 minutes and baste with your butter mixture about every 10 minutes. After 25 minutes, move your king crab legs closer to your heat source on your smoker for 2 minutes on each side. This is to ensure your king crab legs are warm and have a nice charred appearance on the outer shell when you serve them. Pull them off your smoker and serve immediately. You can also warm up a couple bowls of butter for those who like to dip their crab meat directly in butter (optional). Total smoking time for your king crab legs should be about 30 minutes. Remember that all smokers are different depending on the heat source and how far away you position your king crab legs from the flame.